Network DVD have announced the upcoming DVD release of two acclaimed works from television history that would otherwise have been confined to the archives, the Sunday Night Drama The Arcata Promise and the crime series The Scales of Justice. Once upon a time, in the small town of Arcata in California, a rich and successful actor made a promise to a young, attractive and vulnerable girl: "I shall love you. Look after you. I don't want to hurt you or oppress you, or deny you in any way." But the promise was broken. After being constantly abused and assaulted, the girl left, and the actor fell into a self-destructive spiral: drink, no friends, no work. Now, left alone in a shabby basement flat, he is haunted by that promise, the girl to whom he made it, and himself. Oscar winner Anthony Hopkins stars opposite Kate Nelligan in renowned playwright David Mercer's intense, harrowing screenplay, for which producer Peter Willes received a Silver Medal for Outstanding Creative Achievement from the Royal Television Society. First screened as part of ITV's Sunday Night Drama anthology, The Arcata Promise showcases a tour-de-force performance from one of the world's most significant and respected actors. 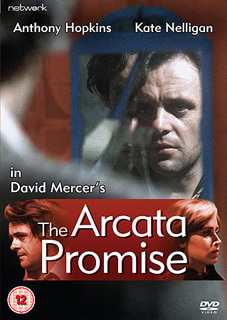 The Arcata Promise will be released on UK DVD on 17th December 2012 by Network DVD at the RRP of £12.99. Following on from the success of Anglo-Amalgamated's Scotland Yard and Edgar Wallace Mysteries, the production company scored another hit with this classic drama. All the dramas are based on real-life trials that dramatise the alleged crime all the way through to the courtroom. As with the previous series, the films were produced at the company's Merton Park Studios which were screened as support features in British cinemas, making a successful transition to the small screen during the 1970s. Introduced by crime writer Edgar Lustgarten and complemented by The Tornados' memorably pacy theme music, the dramas feature performances from some of the era's finest, and now most instantly recognisable, actors – including Alexandra Bastedo, Patrick Wymark, Peter Barkworth, Keith Barron and Garfield Morgan. 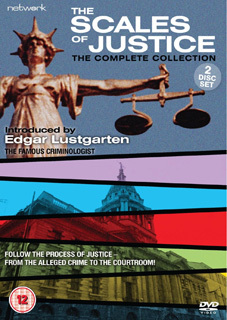 The Scales of Justice – The Complete Series will be released on UK 2-disc DVD on 24th September 2012 by Network DVD at the RRP of £19.99. Again, no extra features have been listed.